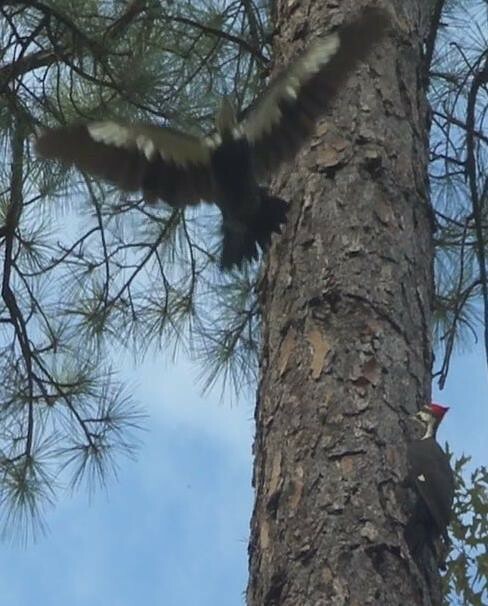 Pileated Woodpeckers, Lowndes County, Georgia. Also, the bird on the tree shows the small white patch of the Pileated. Or, as the Pileateds like to say, "yucka yucka yucka!" PS: Wild turkeys (Meleagris gallopavo) can be more than twice as long as either of these birds. While I have seen them flying, I've never seen a turkey perching on the vertical side of a tree.